4. The air-conditioning will turn on according to the detected ambient temperature, outside (fresh) air position and higher fan speed will be selected automatically. 5. If blower fan speed is low, the blower fan speed will be set middle speed automatically. 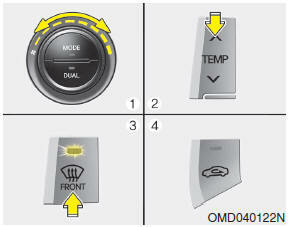 If the air-conditioning, outside (fresh) air position and higher fan speed are not selected automatically, adjust the corresponding button or knob manually. If the position is selected, lower fan speed is controlled to higher fan speed. 1. Set fan speed to the highest position. 2. Set temperature to the extreme hot (HI) position. 4. The air-conditioning will turn on according to the detected ambient temperature and outside (fresh) air position will be selected automatically. 5. If the air-conditioning, outside (fresh) air position and higher fan speed are not selected automatically, adjust the corresponding button or knob manually.